BENTON, Ky. (AP) — A Kentucky school district where two students were fatally shot last year has been awarded a second federal grant to help recover from the tragedy. NASHVILLE, Tenn. (AP) — U.S. Education Secretary Betsy DeVos is coming to Nashville to visit a public charter middle school. PROVIDENCE, R.I. (AP) — The head of Special Olympics in Rhode Island is thanking President Donald Trump for authorizing continued federal funding for the Special Olympics. MOUNTAIN HOME, Ark. (AP) — The Arkansas State University System has repealed its policy on free speech zones to comply with a new state law. BOSTON (AP) — Democrats in Congress are accusing the Education Department of interfering with an investigation by the agency's independent watchdog. PROVIDENCE, R.I. (AP) — Rhode Island Gov. Gina Raimondo says she's opposed to a major overhaul to the way colleges and universities handle sexual misconduct complaints proposed by Education Secretary Betsy DeVos. DeVos has proposed adding protections for students accused of assault and harassment and narrowing which cases schools would be required to investigate. JEFFERSON CITY, Mo. (AP) — Republican lawmakers are proposing an overhaul of how Missouri universities handle sexual harassment and assault claims to add more protections for the accused. TALLAHASSEE, Fla. (AP) — Cementing his push to remake the Florida Supreme Court, Republican Gov. Ron DeSantis on Tuesday appointed a top official from the administration of President Donald Trump for the final spot that remained open on the state's most important court. DeSantis picked Carlos Muniz, who had been working as general counsel for the U.S. Department of Education under Education Secretary Betsy DeVos. WASHINGTON (AP) — Wielding control of the House and a new set of investigative powers, Democrats are preparing to bring Education Secretary Betsy DeVos under the sharpest scrutiny she has seen since taking office. WASHINGTON (AP) — Education Secretary Betsy DeVos is recovering from a broken pelvis and hip socket that she suffered in a recent cycling accident. DeVos commented on her injuries Thursday while speaking in Washington at an event for young entrepreneurs. It was her first public appearance since the accident earlier this month. The 61-year-old DeVos is using a wheelchair while her injuries heal and is expected to make a full recovery. CONCORD, N.H. (AP) — A former Dartmouth College student has sued the school, saying he was unjustly expelled over a sexual assault allegation. New Hampshire Public Radio reports the complaint filed Monday in federal court alleges a consensual encounter between the student, identified anonymously as John Doe, and another student, identified as Sally Smith, last spring. Education Secretary Betsy DeVos is recovering after undergoing surgery to repair a broken bone suffered in a cycling accident. A department spokeswoman says DeVos is resting at home after the Thursday surgery. She is expected to recover fully. The spokeswoman did not immediately answer questions about the accident or the nature of DeVos' injury. The Trump administration has formally scrapped an Obama-era policy that was meant to curb racial discrimination in schools but that became tangled in a national debate over school safety. Officials from the Education and Justice departments finalized the rollback Friday, just days after it was proposed by a federal panel on school safety. 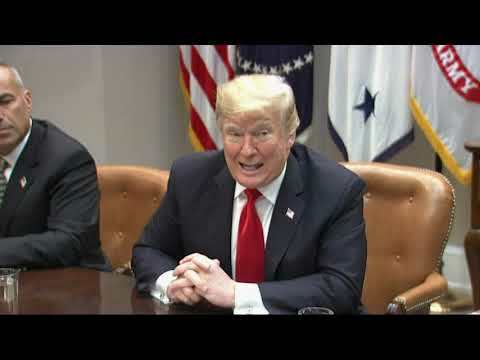 President Donald Trump formed the panel in March as the government's response to the February school shooting in Parkland, Florida. Education Secretary Betsy DeVos was not on the ballot in the Michigan governor's race, but her legacy loomed over the campaign in her home state, which has the country's highest concentration of for-profit charter schools. WASHINGTON (AP) — Education Secretary Betsy DeVos said Tuesday that ballooning student debt has caused a "crisis in higher education," and that the traditional path to college might not be the best choice for all students. DeVos made the comments in Atlanta at a training conference for the Education Department's Federal Student Aid division, which oversees student loans awarded by the federal government. The department released a text of her remarks. Education Secretary Betsy DeVos on Wednesday restored federal recognition to an accrediting group that oversees dozens of for-profit colleges but was shut down by the Obama administration over allegations of lax supervision. CONCORD, N.H. (AP) — New Hampshire's Republican governor has joined Democratic congressional members in expressing concern over Education Secretary Betsy DeVos' proposed overhaul to the way colleges and universities handle sexual misconduct complaints. Education Secretary Betsy DeVos has proposed a major overhaul to the way colleges and universities handle sexual misconduct complaints, adding protections for students accused of assault and harassment and narrowing which cases schools would be required to investigate. Education Secretary Betsy DeVos on Friday proposed a major overhaul to the way colleges and universities handle sexual misconduct complaints, adding protections for students accused of assault and harassment and narrowing which cases schools would be required to investigate. RALEIGH, N.C. (AP) — North Carolina's first female governor is taking another trailblazing role as head of a board that oversees standardized tests designed to measure student achievement across the country. U.S. Education Secretary Betsy DeVos announced Friday that former Gov. Beverly Perdue is now chair of the National Assessment Governing Board. Perdue is identified as the first woman to chair the board in its 30-year history. DETROIT (AP) — Dozens of people who said they were victims of sexual assault by doctors at three major universities urged Education Secretary Betsy DeVos to make campuses accountable for investigating abuse allegations in a letter released Thursday. WASHINGTON (AP) — The Education Department said Friday it will no longer try to delay an Obama-era regulation that helped students defrauded by for-profit colleges get their loans forgiven. A federal court ruled last month that Education Secretary Betsy DeVos' decision to delay the regulation, known as borrower defense, was unlawful and that the rule should go into effect. The department had until next Tuesday to respond. NEW ORLEANS (AP) — U.S. Education Secretary Betsy DeVos is wrapping up a southern tour by visiting two public charter schools in New Orleans. DeVos brought her "Rethink School" tour to New Orleans on Friday. DeVos visited Edward Hynes Charter School to observe what it calls "academically rich, innovative programs." LEXINGTON, Miss. (AP) — Students in a poor part of the Mississippi Delta are receiving high-level science instruction aided by online lessons. U.S. Education Secretary Betsy DeVos went to Holmes County Central High School in Lexington on Thursday to see the Advanced Placement physics class. WASHINGTON (AP) — The Education Department is unveiling a mobile program intended to make it easier for students to apply for federal financial aid. Education Secretary Betsy DeVos rolled out the myStudentAid app on Tuesday. She says applicants will now have the necessary tools to apply for loans and grants "in the palm of their hand." AUGUSTA, Maine (AP) — Three Maine schools have been named Blue Ribbon schools by the U.S. Department of Education. The Portland Press Herald reports that Dr. Levesque Elementary School in Frenchville, Falmouth High School and Yarmouth Elementary School have all received the distinction. NASHVILLE, Tenn. (AP) — Six Tennessee schools are being recognized as National Blue Ribbon Schools for 2018. These schools include Discovery School in Murfreesboro, Donelson Elementary in Arlington and Hume-Fogg Academic High School in Nashville. They also include Lakeland Elementary in Lakeland, Merrol Hyde Magnet School in Hendersonville and Scales Elementary in Brentwood. The schools will be honored at an awards ceremony next month in Washington. CHESTER, W.Va. (AP) — Three West Virginia schools have been recognized as National Blue Ribbon Schools for 2018. The schools are Allen T. Allison Elementary in Hancock County, East Lynn Elementary in Wayne County and Mount Lookout Elementary in Nicholas County. The honor is based on a school's overall academic performance or progress in closing achievement gaps among student subgroups. LEE, N.H. (AP) — A New Hampshire school is being recognized as a National Blue Ribbon School. U.S. Secretary of Education Betsy DeVos on Monday recognized the Mast Way Elementary School in Lee. She says the award affirms the hard work of educators, families and communities in creating safe and welcoming schools where students are prepared "for successful careers and meaningful lives."